The summer months are ahead and that usually means major changes around the house. The kids are home, there’s more time for fun, and everyone wants to be outdoors. As our routines begin to change with the warmer weather, it’s a good time to evaluate what we’re doing right and what needs improvement. With the start of summer vacation, parents are always scrambling to find ways to keep their kids busy. But for kids, it’s often a time to relax and unwind. That usually means waking up much later than when school is in session. Make sure that your kids are still following their morning routine when it comes to oral hygiene. Just because they may wake up right before lunch doesn’t mean they get to skip brushing their teeth in the morning. Maintaining consistent habits like brushing and flossing when they first wake up will give them a fresh start to the day. While they’re home, the tendency is to snack throughout the day. Make sure that you have healthy snacks available, like fresh fruits and vegetables, not just the typical cookies and chips. Don’t bring home any soda. Trust me, with all the graduation parties, barbecues, picnics, and other special events throughout the summer, they’ll get more than fair share of the stuff. While they’re home, encourage them to drink more water. Regardless of the time of year, adequate water throughout the day is essential to stay healthy, and to clean out any loose carbohydrates left in their mouths after snacking. The summer also means kids tend to stay up later at night. Once again, don’t let them off the hook with their nighttime routine. If left to their own devices, teenagers likely will end up falling asleep with a phone or a video game controller in their hands. Make sure they get through their brushing and flossing before they sleep. And remember…no midnight snacks! (Unless you want to deal with a condition I like to call “death breath”). Once you finally make it outside to enjoy the weather, remember that hydration is key. Make sure that everyone who is spending time outside is getting plenty of water. It should be second nature to pack water bottle for everyone, consider it one of the essentials. If you play an active sport or if you exercise, consider a sports drink with added electrolytes. When you sweat you lose a lot of the body’s electrolytes along with that water, and they need to be replenished if you want to stay healthy. Just remember, sports drinks are only for drinking when you really need them, not if you’re just holding down the couch! They’re good for you when your body is lacking nutrients, but if taken when the body is idle, they just add more acid and sugar to your mouth, feeding those cavity causing bacteria, but providing no benefit. 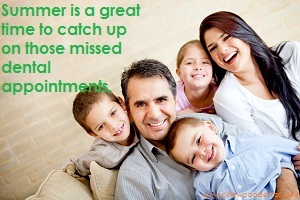 Finally, summer is a great time to catch up on those missed dental appointments. The kids are off of school, so you can get to set up appointments during the day when it normally would have been impossible. Maybe someone had a cavity that needed filling, or maybe they’re just overdue for their six-month check-up and cleaning. Whatever the case may be, don’t let the summer pass you by without getting your mouth in order. The last thing you want is for dental pain to stop you from enjoying a warm and beautiful summer!